"Great post. I found it very informative. Real Montreal florists." Note: I changed the link in all examples. Do you notice something fishy about this comment? You should. First, the comment is not a real reply to the post. Second, the anchor text in the comment is rich in competitive keywords. In other words, this comment was made for the sole purpose of creating a link to a different website. After some research, we discovered that it was an order gatherer trying to create link to his online store. All real florists should be aware of this sneaky technique. Today, we will continue spreading the word for Florists for Change. We will show how we discovered a new Canadian order gatherer. They pose as a variety of Canadian florists. They have at least one misleading Montreal florist website (MontRoyalFlorist.ca). We began by looking at their website. We noticed that many pages were spamming keywords. 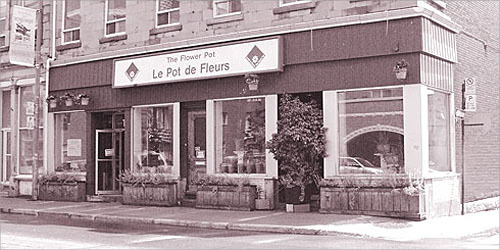 For example, "Montreal Florist" appeared every few words on their 'About Us' page and almost always as anchor text. "Montreal Flower Delivery" was also splattered everywhere. Keyword spamming is not highly valued by Google, but it is valued by men and women who don't understand a fundamental principle of search engine optimization: quality content. The second thing we noticed was that this fake florist's Twitter and Facebook accounts linked to a totally different florist located Ontario. I did not verify if this Ontario florist was real. I was just surprised by the boldness of the order gatherer's link building team. After being profoundly disturbed by the front, we decided to verify their contact information. We found a local phone number but no address. Instead of an address, we saw a screenshot of a map of Montreal. In any case, some order gatherers might be tempted to display a false address. An easy way to check if an online florist is honest is to check the location on Google street view. Do you see a flower shop located at that address? If yes, can you make out the name of the store? First, the comment is not a real reply to the post. Second, the anchor text in the comment is rich in competitive keywords. In other words, this comment was made for the sole purpose of creating a link to a different website. Thats all I can say. You most definitely have created this weblog into something thats eye starting and essential. I am very much satisfied with the material you have described. I desired to thank you for this excellent content. I experienced every little bit aspect of it and I will be awaiting the new up-dates.